The plate is too big? 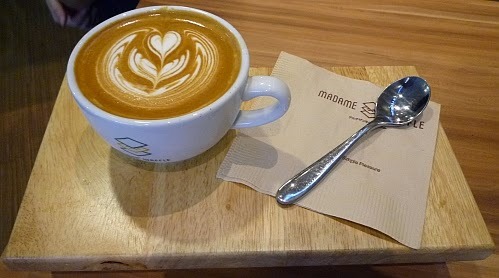 Flat white - MYR10.50 - very rich taste. A must try for those with a sweet tooth. 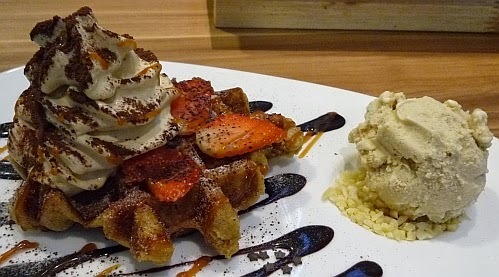 Without ice cream and cream, a piece of waffle is about MYR6 something. I find it a tad too sweet. 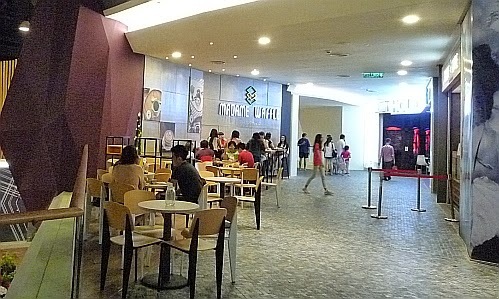 It is located at the top floor of Midvalley, the mezzanine floor above the cinema. The seating area is beside the walkway. oh this section is already opened?? interesting to know there are more places to explore in MV.. I usually just go to the gym and then leave, hahahaha!! 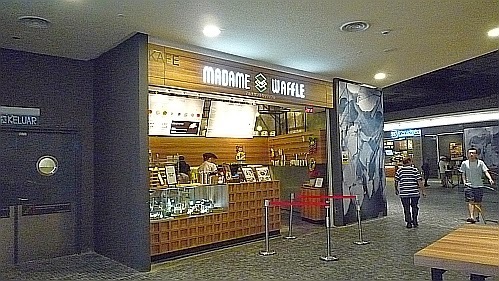 There are more eateries there yet to open soon. I don't do fine dining. Sure go try after your gym! Then go gym again to burn away the sugar. Oooo the coffee tiramisu looks big, but after reading your caption, hmm yeah, maybe the plate is big only..I love sweet stuffs, I dont mind having 3 plates of waffles with ice cream.. I think you cannot eat 3 plates due to the level of sweetness. Waffles! Must be the current trend, everyone's opening a waffle joint and everyone's blogging about these. So far I only know of this one. Very prettily presented, that waffle! Yes, they even put tiny stars made of chocolate. I think I will like savoury waffles too. That looks nice! But if it is too sweet, I would not enjoy it as much. The cream and ice cream are sweeter than the waffle. You finally tried this. I thought you said you have a sweet tooth...I think you have a dessert tooth instead...kekeke...since you can't take sweet stuff. I thought I have a low sugar tolerance level but looks like yours is even lower. Anyway, desserts are meant to be sweet, otherwise it wouldn't appeal to the masses with a real "sweet tooth"!! looks good. nah plate not too big la. The tiramisu looks huge to me. Nice presentation. I think you are referring to the cream on top of the waffle. 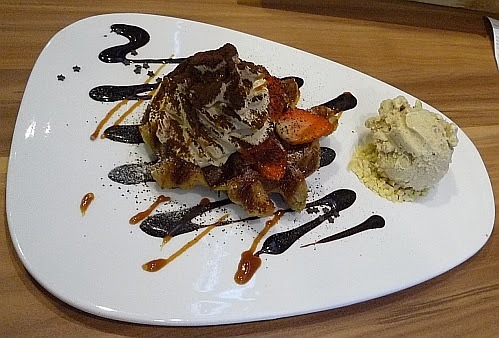 Coffee Tiramisu Waffle for me please...looks good. You have a sweet tooth too? Too big? Didn't you realize when you start eating that the plate is actually to small (to make a mess with)? Wow! Good that you are making your own waffles.